When you’re out on the streets creating Strava art, it pays to pay attention, ride defensively and “mentally rehearse” different crash scenarios. The work of the Strava artist is fraught with peril. While venturing down unfamiliar sidestreets and alleyways – often in the dark – I’ve encountered gaping potholes, loose gravel, fallen tree limbs, skittish deer and fat raccoons…all startling and potentially perilous. I’ve bush-whacked through brambles, scrambled over chain link fences and skidded down muddy hillsides. Often, my Strava art feels more like a military training exercise than a cycling activity. But the biggest dangers, far and away, are the motor vehicles racing to and fro and the unpredictable creatures presumably controlling them. On February 2, I was about 10 km into a new Strava bike-writing message when a pickup truck pulled quickly through a stop sign on the opposite side of the road, straight into my path. With no time or space for evasive action, I braked hard…but as the roads were wet and I was going more than 40 km/h, I knew a collision was inevitable. Fortunately, due to a near miss in a similar situation several years ago, I’d mentally rehearsed for that very scenario. What would I do, I’ve often wondered, if I found myself suddenly face to face with the side of a minivan or transit bus or, well…a pickup truck? The best course of action, I decided, would be to turn my front wheel hard to the left or right and throw my shoulder into the impact. The alternative – riding straight into the vehicle – would result in a powerful meeting of face and head with metal or glass…a recipe for serious injury, never mind the damage to the wheel, fork and frame of the bike. With a split second to react, my mental rehearsals made all the difference. After a short skid that slowed me from 43 to 20 km/h (according to my Garmin), I turned my front wheel hard to the left and turned my right shoulder to take the brunt of the impact. And did it work? Well, the photos here show the damage to me (scraped chin and shoulder), my bike (scuffed Garmin and handlebar tape) and the pickup truck I collided with. PS – As you can see, I botched the “b” in my bike-writing message and would have had to do it all over again anyway. Is this what they mean by “silver lining”? This entry was posted in bike-writing, cautionary tales, gps art, tips & tricks and tagged bicycle, bicycling, bike-writing, crash, creativity, cycling, cyclist, garmin, gps, gps art, strava, strava art, victoria bc. Bookmark the permalink. Well done for quick thinking and evasive planning! Five weeks later, I can still feel it in my shoulder. I shudder to think of how bad things would be if my head had made that impression in the truck! I am sometimes astounded at the actions of some drivers. The other day, I signalled to turn right (we drive on the left side here) and a car actually overtook me on my right! If I had started turning as per my hand signal that would have been very nasty. Were you able to get back on your bike after the accident? Fortunately, yes. My left hand was pretty tender (from landing on the pavement after the collision), but other than that and my achy shoulder, I was totally intact. My bike was fine too. 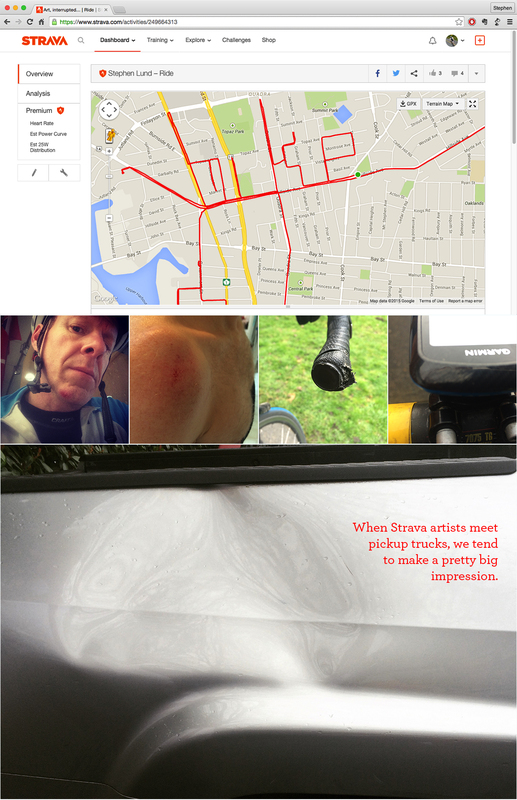 I pedalled from the accident to the police station and then the insurance company to file a report…and got out again a couple days later to finish my “interrupted” Strava art! Glad to hear you avoided disaster as well. It happened in early February and I was fortunate to escape without serious injury – some deep and persistent aches in hand and shoulder, but nothing that has forced me to park the bike!